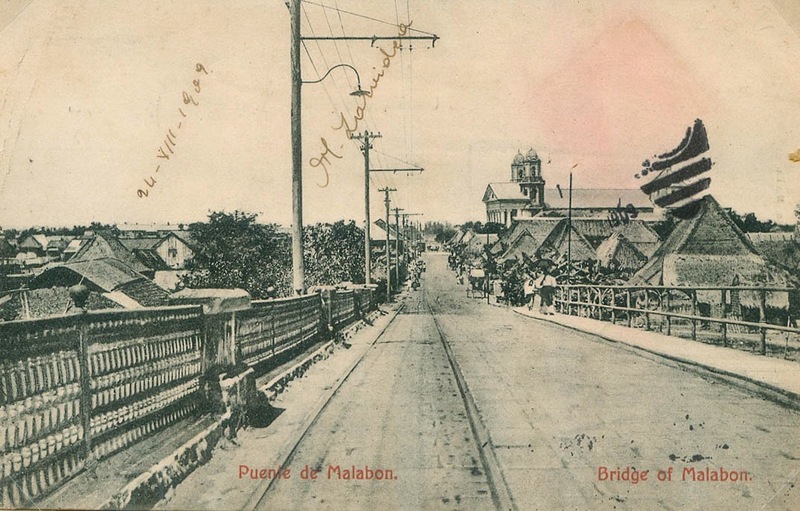 The City of Malabon is presently in the midst of celebrating this year one of its historic festivities. 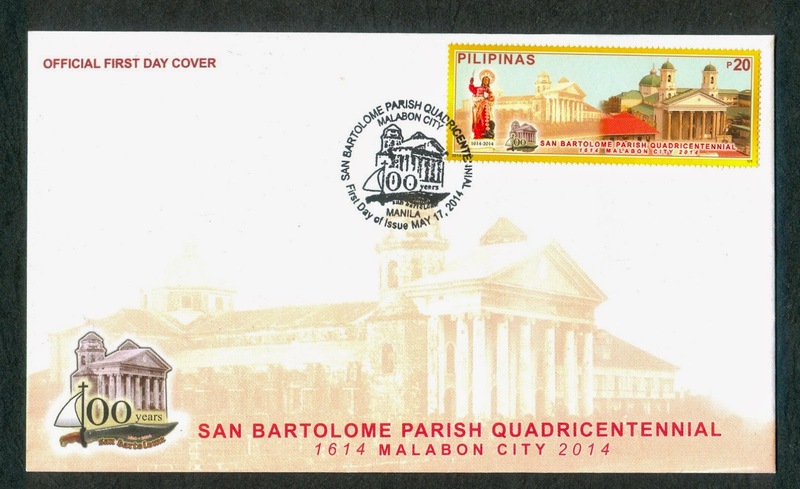 This is the 400th Anniversary of the San Bartolome Parish Church, one of the oldest churches in the country. 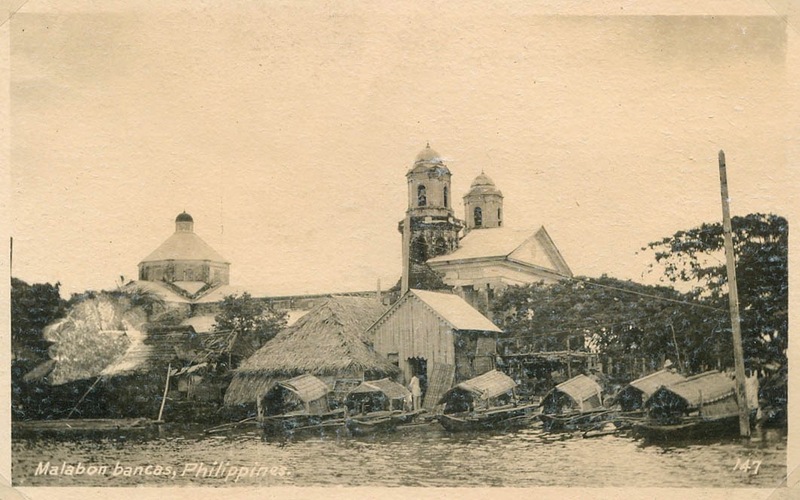 Malabon was called Tambobong during the early Spanish era until it was established as an independent parish by ecclesiastical authorities on May 14,1614 under the patronage of San Bartolome Apostol. The historic church is the parish of Malabon’s first stone edifice built by the Augustinian Order under Fray Diego de Robles. The present Parish Priest of the Church, Fr. Ric Torrefiel, has done wonders in improving and beautifying the church, inside and out, that drew tributes and praises not only from church parishioners but also from those who have personally seen and observed the building and its environs, including no less than Pres. P-Noy Aquino himself when he attended recently the wedding of his first cousin, Malabon Mayor Len-Len Oreta, who expressed his admiration for the beauty and edifying appeal of the Church. It may be expecting too much but we hope and pray that sooner or later, San Bartolome Church becomes one of the region’s tourist destinations. 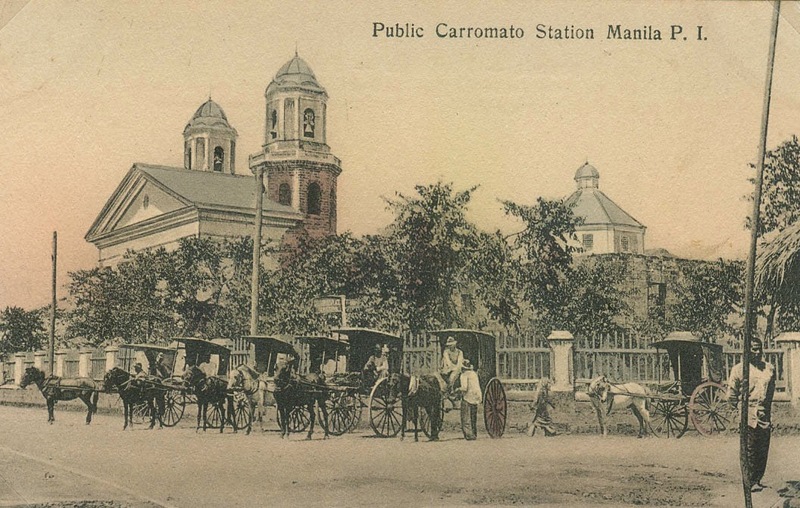 At the end of the 19th century the biggest tobacco company in the Philippines, was the Compañía General de Tabacos de Filipinas, more popularly known as Tabacalera. The history of Tabacalera played an important role in the economic history of the Philippines and in Philippine-Spanish relations. 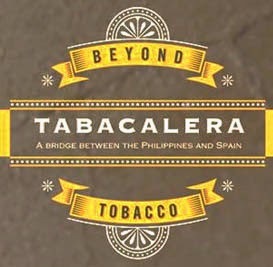 For the very first time the Embassy of Spain in the Philippines, in partnership with the Ayala Museum, held an exhibit “Tabacalera: Beyond Tobacco”. Curated by Prof. Martin Rodrigo, historian from the University of Pompeu Fabra in Barcelona, Spain, the exhibit showcased artifacts and other memorabilia from Tabacalera. 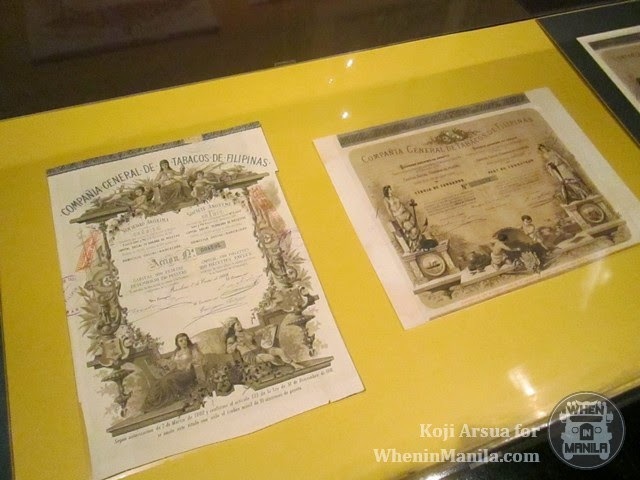 Exhibited were memorabilia, maps, books, art, cigarette wrappers and photographs of the Compañia General de Tobacos de Filipinas during and after the Tobacco Monopoly in the 19th century. The artifacts exhibited were on loan from Filipino and Spanish institutions and private collectors. Compañia General de Tabacos de Filipinas or Tabacalera was founded on November 26, 1881 by a Spaniard, Antonio Lopez Lopez, the first Marques of Comillas. 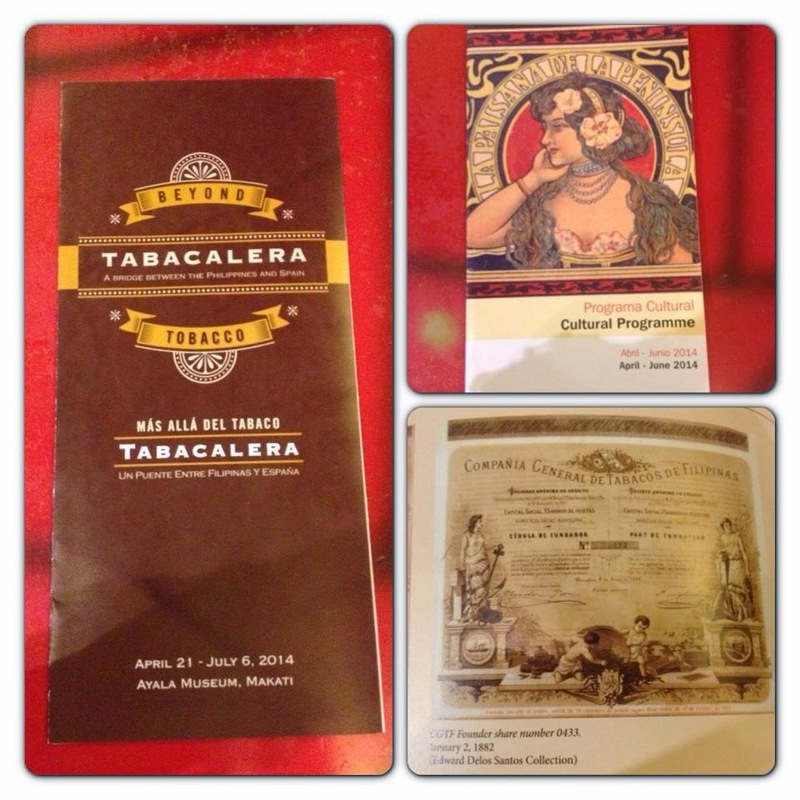 Tabacalera was established with the intention of taking over the Philippine Tobacco Monopoly from the Spanish colonial government. 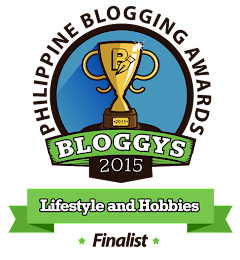 During its heydays, the company controlled 90% of the whole Philippine tobacco industry. 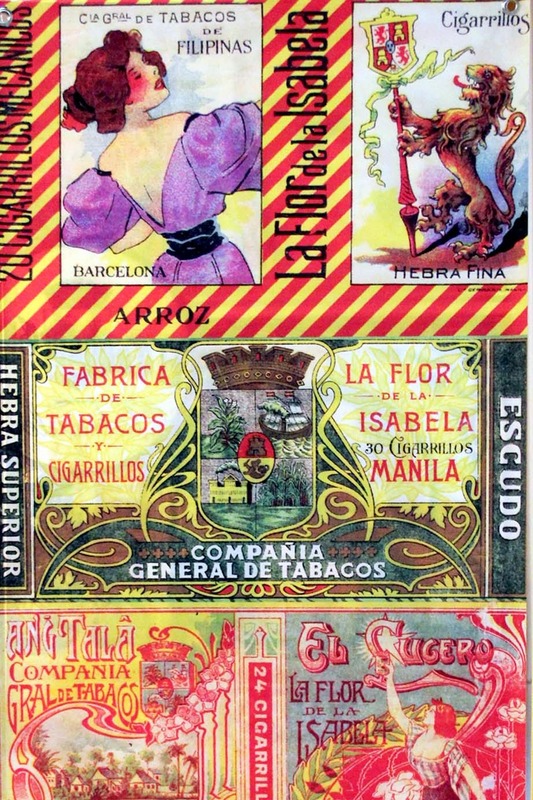 It took over many tobacco plants from the colonial government but soon opened its own factory in 1895 called La Flor de la Isabela. 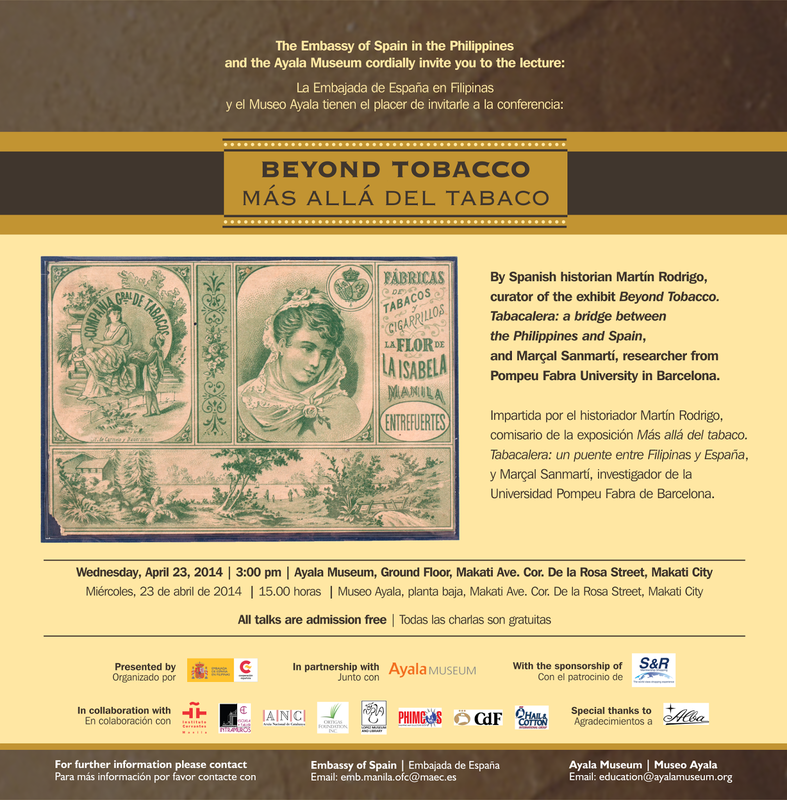 The "Beyond Tobacco: A Bridge Between the Philippines and Spain" Exhibit was held this year (2014) from April 21 until July 6 at the Ayala Museum. A series of lectures were held at the Ayala Museum from April to June to further deepen the public’s understanding about the tobacco industry in the Philippines. What coinage was legal tender in the Philippines, China, United States and its Pacific Possessions and some other countries before World War II? 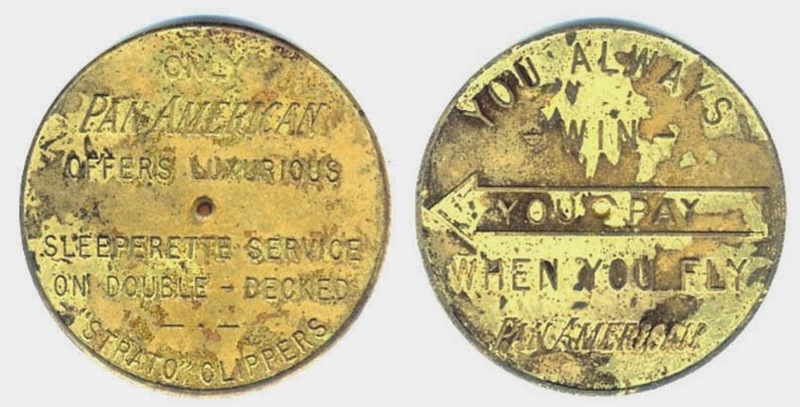 Answer: the “Strato Clipper Token” of Pan American Airways. 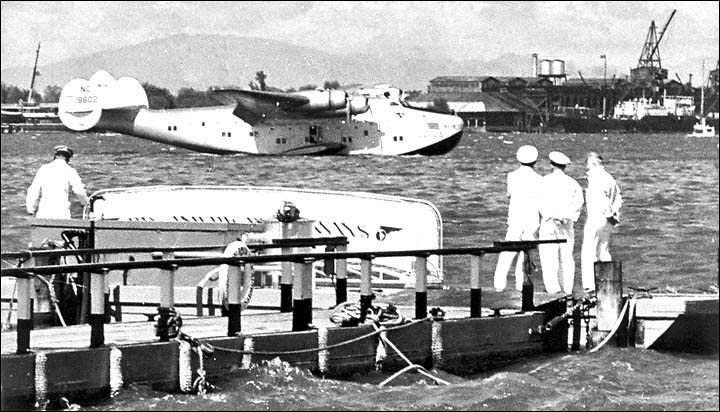 The first Trans-Pacific Flight arrived in Manila Bay using the commercial airline ”China Clipper” of Pan American Airways on November 29, 1935. 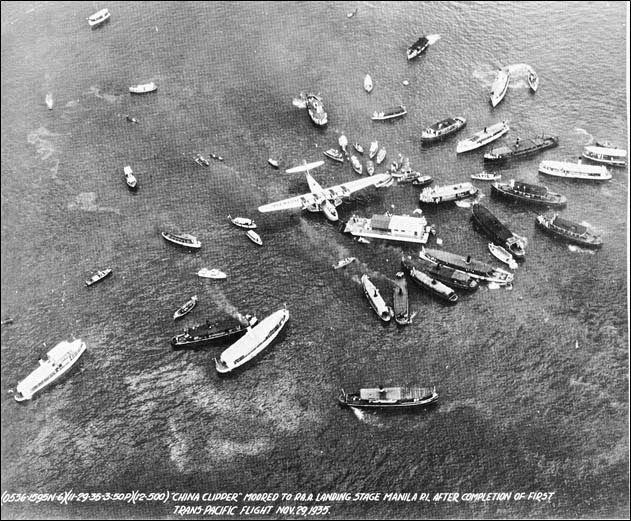 The sea became its landing site since the airplane had a boat-like landing gear. The La Vanguardia newspaper of the following day, November 30, 1935 (above), showed a picture of how many people watched the arrival of the first commercial flight to the Philippines. 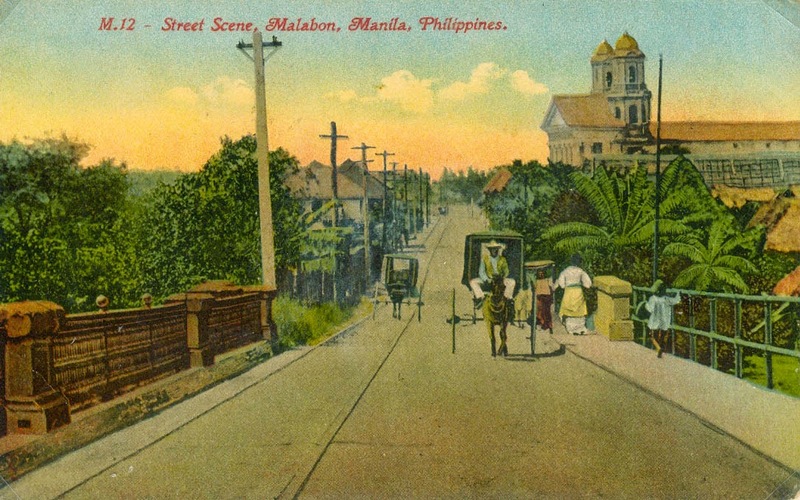 There were more people watching on the left side, where Manila Hotel was located. 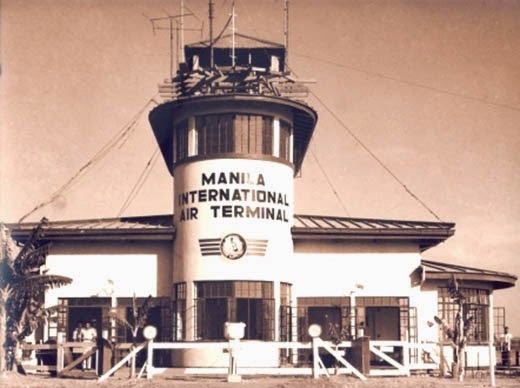 The first commercial flight to depart from the Philippines left Manila Bay for the Guam-Honolulu-San Francisco flight on December 2, 1935 (photo shown above). It carried mails bearing a Pan-American Airways cachet. The seaplane was a Martin M-130, a four-engine, commercial flying-boat transport. It was 90.1 feet in length, 24.7 feet in height, with a wingspan of 130 feet. At gross weight of about 51,000 - 52,252 pounds, it was powered by 4 Pratt & Whitney Twin Wasp R-1830-S2A5G radials engines. With China Clipper’s Chief pilot Edwin Musick, its maximum range was 3,200 miles with passengers or 4,000 miles with mail. 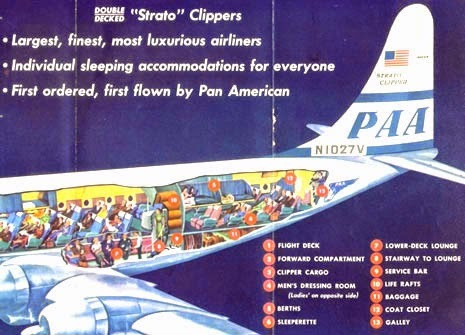 Pan American Airways introduced double-decked “Strato” Clippers when San Pedro Makati completed its Nielson Tower Airport. These new airplanes had wheels as landing gear. Each airplane cost US$1.5 million, with a cruising altitude of 20,000 feet at average cruising speed of 310 mph. Its propellers were free feather, reversible thrust hydromatic with 16 ft., 8 in. diameter square-tipped blades. The tokens were given free of charge for flights across the Pacific and used to pay for the use of the upper Sleeperette couch that could recline way back to near horizontal position at a press of a button, and upper bed as seen in the pictures above. 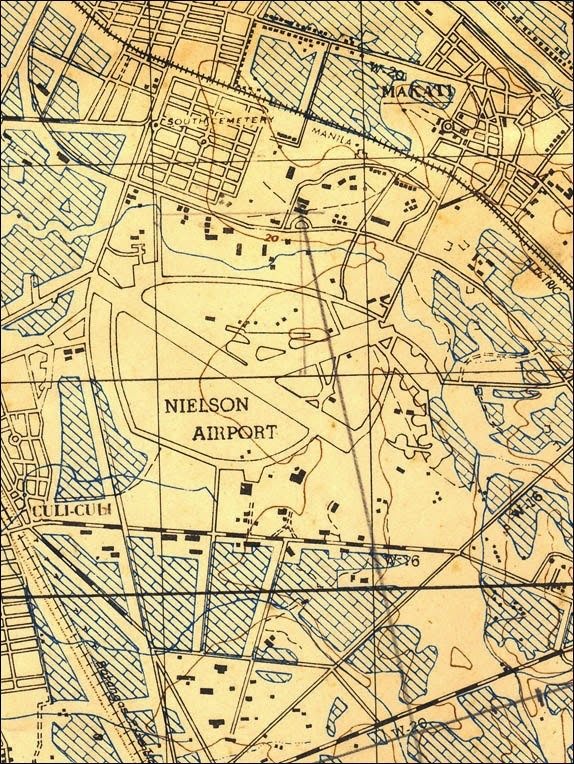 The Nielson Airport is shown on the map below, cropped from Sheet 3454-IV-SW TATAY SW PHILIPPINE ISLANDS N1430-E12100/5, prepared by the Chief Engineer, GHQ, SWPA, January 1945. This map is important since it provides the actual demarcation lines in-between cities, especially the legally disputed boundary between Makati and Taguig.